I had this yellow mesh bag and stuck it over one of the bigger figs–and it has stayed put for weeks now. Hey! So I ordered more. I didn’t need big ones, just big enough to slip over each fruit and tug a little on the strings. Green seemed good; it would help disguise the ripening, right? I’m told (is it true?) that birds tend not to figure out when the green varieties are sweetening up. Mine are the aptly-named Black Jacks, though, so no such luck on that account. So maybe buying green would have been better, but this is what I’ve got. Pro tip: if you search for mesh bags, soon you get Amazon ads for, of course, mesh bags thrown at you. I’m on to them now: the price in those ads was $2.66+free shipping, whereas when I clicked through the various colors offered, the price was suddenly about three times that plus shipping, and when I went back to the white that it had started me at, it, too, was now at the much higher price. Stinkers. Or, to be more charitable, bistro mathematics (a la Hitchhiker’s Guide to the Galaxy). Note that now that I haven’t looked in awhile it’s down another 68c. Anyway. So I went back to the window with the ad and clicked through again. There was the white again at $2.66 total. And here we are. Oh, right, the purple cowl. And I went to grab it before church. 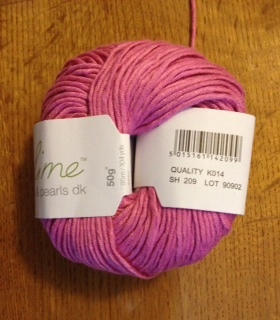 Something in me said and grab that pink pearl-yarn one, too. ?? Okay, so, I did, a little surprised. I’d forgotten even making it and here I was looking for it. I grabbed a back-up purple, too, but I didn’t think that one was quite it. As church was letting out, I found a private moment and gave the friend who’d wanted purple her choice of the three; she picked the one she didn’t know I’d made specifically for her this past week and put it on instantly no matter the thickness in summertime and wore it proudly. Totally made my day. Then I went looking for another friend. She was wearing a white dress and I was mentally going through my stash of white yarns when I finally caught up to her collecting her children. She was startled and laughed and couldn’t believe I was asking her and shook her head no on the allergies thing and pronounced, “Pink!” And then went, “Well…” and tried to describe the kind of pink she really likes. “YES!” And then she was instantly embarrassed because it wasn’t like she was trying to ask for the thing, while I was marveling at how it had just happened to be there. I told her, I didn’t know who I made it for but I knew I made it for someone and then it just sat there waiting for its moment and then this morning it demanded to come here with me. Well there you go. It was beyond perfect as far as she was concerned, and I wondered why I hadn’t figured out sooner that she was the person for it. But after a few hours’ reflection, I think it’s this. She had taught the lesson today and had told some stories on herself that she might have wondered if they would make anyone think less of her. I would be very surprised if anybody did–allowing ourselves to be vulnerable is the greatest act of faith in one’s listener one could ever offer them, and she’s a peach. Today was the day that young mom needed that vote of confidence. And it was waiting for her before she said a word. Happy Birthday to our friend Phyllis! There was a side conversation about, like, take the word nature, but if something is of nature it’s natch-eral not nature-al and how do you know that unless someone corrects you for doing it wrong. The other immigrants chuckled knowingly. 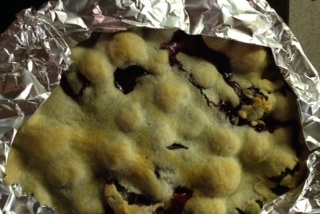 Phyl added whipped cream on top to make a more honest dessert out of that, um, pie. Andy’s called me yesterday to let me know that if I still wanted a case of Baby Crawfords, they were in. Hey! Twist my arm! But Richard had a doctor’s appointment and I didn’t have the car, so it had to wait till today. Andy’s let me make off with a case of half Lorings and half Kit Donnells too as long as I was there: I don’t run out of people who wish for his peaches like I don’t run out of people who want me to knit for them. I almost chose all Kit Donnells (seriously, Mom and Dad. If only I could bring you a taste-testing party.) But when there are my childhood’s Lorings one must buy at least a few and they are far from shabby. “Thank you. Thank you,” he said, and turned back to his post and sign and seat, devouring the thing, the pit showing top to bottom inside that beautiful ball in his hands as my light turned green. And that. That was the best-tasting peach of all. But that is pure hubris anyway. He might be in the hospital then, he might not even be alive. I don’t know how many people know that the current Republican bill, among its many other problems, would allow employer-based health insurance to reach in and deny coverage to the chronically ill—lupus is specifically targeted, hey, it was nice knowing you all–coverage that the employees are paying for out of their paychecks, and with the ACA gone we patients would be unable to buy any anywhere else, either. 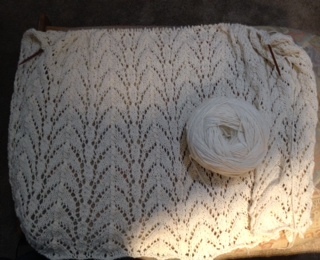 But hey, I got a lot of blanket knitted! I called McConnell’s office, got through on the first ring, and told whichever intern answered the phone that McConnell is only pushing on that bill because my uncle the late and generally-right-wing Senator Bob Bennett of Utah is dead. Because McConnell wouldn’t have been able to look Bob in the eye. Bob was a Republican, but he also believed American businesses could not compete as long as their workers knew they were one medical crisis away from losing everything. He had lived through losing his job and his insurance when he’d had a young family to support. He knew. Seventeen repeats done, five or so to go. I think. 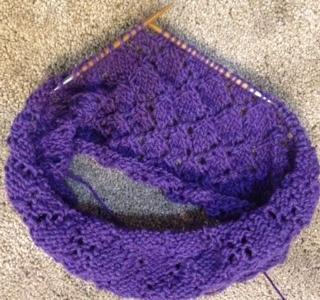 Since no water has touched that lace yet, it’s a guess how far it will stretch. It’s either 34″ long now (relaxed) or 43″, depending on whether or not you pull it to where you think it might go later. 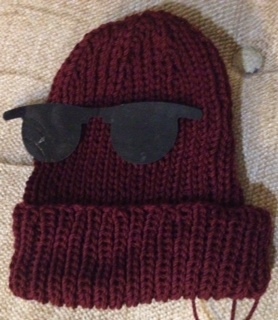 The hats: they knew I loved to knit but they never at all expected me to knit for them. And I never really expected them to instantly treasure them that hard, but they did, which made me want to jump right in and do that again for someone else. Some people just recharge the knitting batteries by who they are, y’know? The figs: rolled in melted butter, roasted, then drizzled with a little honey–mostly because they were from the store and picked before they were as ripe as they should have been, and once you pick them off the tree they’re done. Not much to these on their own. The scent didn’t quite pull me in all the way but then that first bite did: instantly I was back at the summer when I was eight and a half and my little sister turned seven. Our grandparents took us on our first plane rides (one dressed up for it in those days) to stay with them for two weeks in Utah. And part of that stay was at the cabin they owned up near one of the ski resorts high in the mountains. There was no phone service, unless you took a goodly walk down the road to the country store there, and that made it perfect for Grandpa to have an actual vacation: nobody could reach him unless he wanted them to, or unless they were willing to make the long steep drive up that mountain, and if it was that important it would be something they didn’t want discussed on a public phone in front of everybody, in which case we kids were to clear out of the cabin till called back. My grandmother tells the story in her autobiography of being woken up in the middle of the night by the phone ringing in the next apartment over at their DC place, and as soon as she was awake enough to be glad her freshmen Senator husband wasn’t important enough for reporters to flock to for a quote and started falling back asleep, by their own. The Cuban Missile Crisis had just broken and reporters wanted these two Senators’ reactions to the news. Well, actually, they were sound asleep and oblivious, thanks. Were. Grandpa very much believed in being of service to his constituents, but those two weeks every summer he wanted his time to hike and think and just be. To have a break. I think they said that just once, someone on staff had made that drive up, but I’m not sure. I remember how very very cold the water in that creek was (I let it run and splash over my hand but I did not put my feet in it. On purpose, anyway.) It curved right below their patio out their back door. The idea that it could be barely melted snow in the middle of summer was a wonder to me. Something wild that grew at that cabin that my brain could almost, almost pick out from half a century ago, so close, and if the figs had been ripe I think they would have missed it entirely. I could hear my grandparents’ voices again, from when I thought they were old but had no idea. They would have been 67 and 68, with 96 and 95 still to come. When they died, there was no way to pass the place down in the family; there were too many of us to divide it up amongst. But a cousin bought it, and she and her husband are generous in sharing the space. And so, two summers ago, we cousins were nearly all of us there again taking in the familiar old log cabin essence, with maybe an extra couch now as we squeezed in. I didn’t take the hikes through the woods that the others did for old times’ sake, thanks, lupus, and yet the air was crisp and cool as I remembered it, full of unique growing things that do not live where I do, the wildness in the elevation and air and trees. Those figs. I wonder. Something surrounding that path by the creek. Someday I hope to go back and maybe I’ll find what they were trying so hard to belong to. Location location location. Sewn in February, about three feet apart. 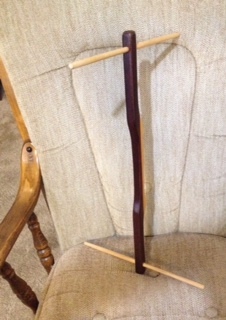 Now about 15″ high vs over 5′. I planted my tomato seedlings in what was a nice sunny spot last year, but I guess the tree nearer the smaller ones grew more than I thought. But then I only had enough wire framing to keep the raccoons out of the one plant, so that works, right? And the guardian acanthus stalks are drying out fast. Meantime, the second hat is done and the ends are about to disappear into them and then they will be tattooed with a “made with pride by…” label inside. Via a separate strand so that if the feel of it ever bugs them, they can simply tug on it gently till it comes out. One down. Let’s see if I can make a second by tomorrow night. With a little more brown to the hat. Clearly it is the boss of me. Hang in there folks, got a long one tonight. Part One. Written Tuesday after I got home. She held the elevator door for him, and he, turning just inside, saw me coming and held it for me. I scooted to catch up not wanting to delay them but they smiled and didn’t mind at all. A chance to be a help to someone in that place is something you don’t pass up on. He turned to her, our having all become friends in the moment, and asked when visitor hours were? Huh. It was eight when I was in here nine years ago, I offered. I cannot do that during the day. Not in summer’s sun. And so I visit during my kind of hours, and he tried hard to make me feel that that’s okay. They decided to send him home early: apparently in part because they’d goofed the paperwork (and admitted to it, which was quite good of them) and the insurance suddenly said well then the charges were not their problem, buddy. I imagine they will have fun fighting that fight, and I’m sure they won’t be the only ones. I dropped him off at the house and trekked over to CVS. It was rush hour. Ten CVS stores couldn’t fill that prescription. But with me standing there going, now what do I do, they checked for me, putting the phone aside for a half hour while the hold music blared: yes, one Walgreens way over yonder could. Which of course our insurance won’t take, but you do what you have to do. I trekked on over there across the endless stop-and-go. They had five doses left. Given the possibility, however hopefully remote, of paying ourselves in full for two and a half days at Stanford Hospital, I asked only for two of them, because CVS had promised to order and be ready in the morning with the rest. Which they did not do. When I called after getting home from Walgreens to double-check, after a half hour on hold with them they said, oh, right, oh well too late, it’ll be Friday. And so, immediately way back over yonder to get another day’s worth from Walgreen’s while they still had it in stock, again paying full price out of pocket–with, again, an extra 20% surcharge for buying so few. Four and a half hours on the road to get an eighth of a prescription, with a mango smoothie from the drugstore for dinner. There is no worry and he’s fine, he’s just recuperating, is all. It was one last evening of no-lupus-friendly gardening time. 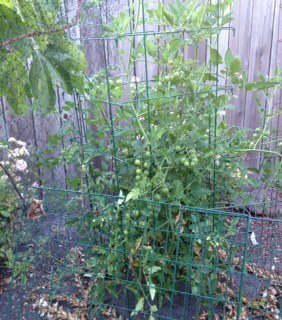 It is skunk o’clock out there and my tomato plants are just going to have to last till tomorrow on their own. I’ve spent enough time typing. I think I’ll go offer him a glass of juice. 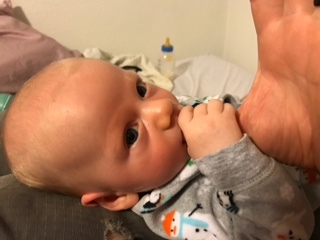 He’s been trying so hard to find his thumb. He found one! Daddy’s will do.